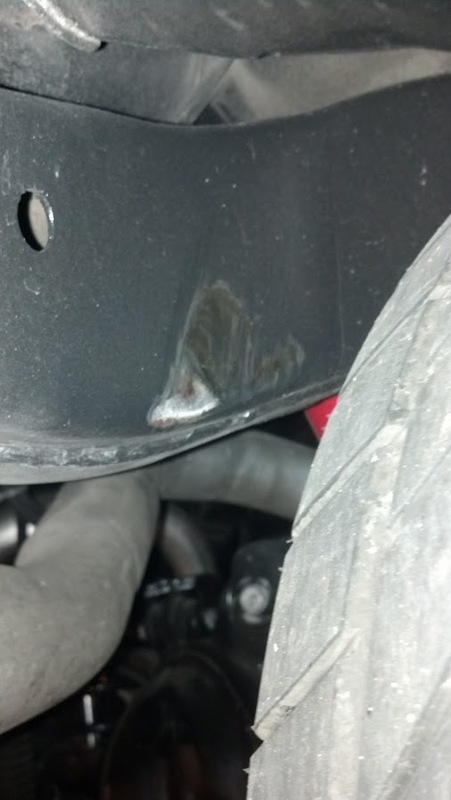 Just finished up my first autocross weekend of 2013 and once I ironed out all of the kinks and started to get used to my new setup, I noticed one thing in particular that is slowing me down and I'm not sure why my car does this? Not sure if it is something car setup related or something I'm doing inside the car. I ran my GoPro behind all four tires over the weekend, the back tires on Saturday during the test n tune session and the fronts on my first two runs of Event 1 on Sunday. Here's the video of all of them. At about 1:58 in, you will notice that my right rear tire starts chattering and the rear looses traction. This happened with some regularity all weekend long, and it only does it on left hand turns...the back actually feels real good on right handers. I've got the front sorted out pretty well too, as long as I get it braked and settled before turning it, the front sticks pretty good. 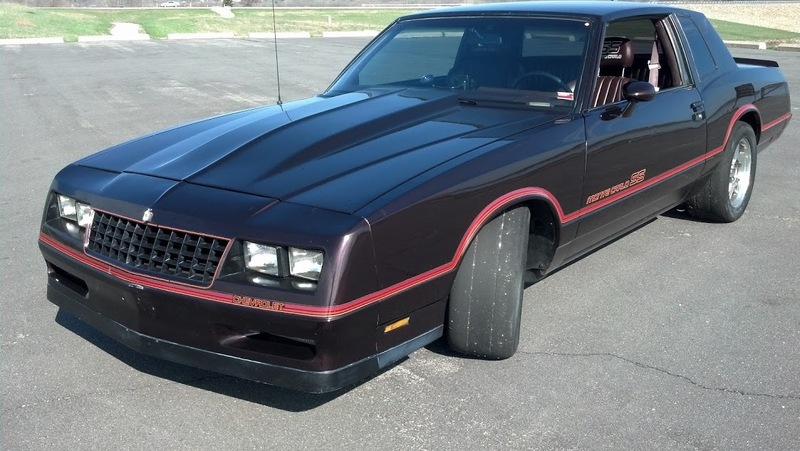 It seems so far like the tires like about 34 psi in the fronts and 30 psi in the rears. Drive train is a carb fed 383 and new this year is a T56. Here is some in car videos from both days also, I'd appreciate any input you guys have at all. 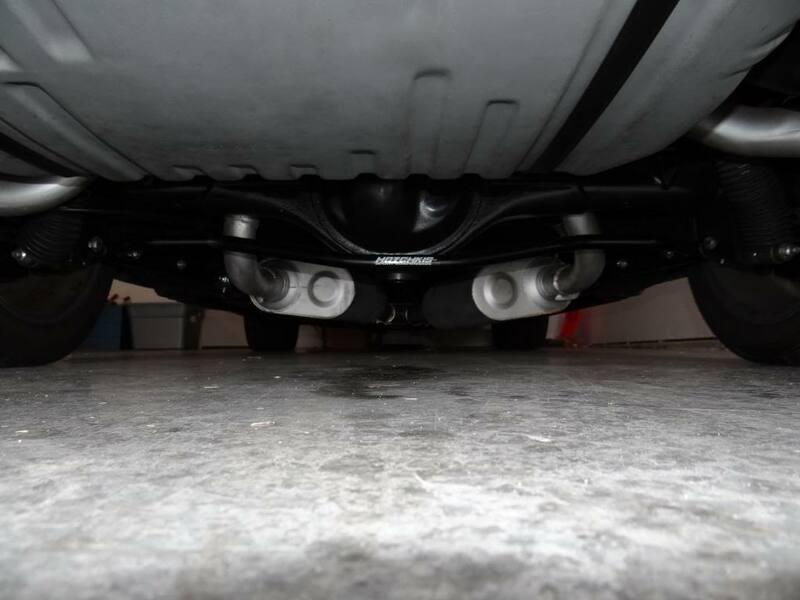 I'm fairly new at this and while not trying to compete directly with all of the Evos and Mazdas out there, I would like to help me and the car run as well as we can without breaking the bank so to speak. Here's a few action shots of the car from the weekend also. Preface....this is coming from a total novice. I would probably replace the shocks to Koni or similar. The videos looked good. smooth driving. PS, it is going to be tough to catch the Evos......That is a well enginered car. The IAS shocks could be causing some of that. Watch the LR as it goes over the first bump just after the initial right hand turn, you'll notice the tire "bounces" after the bump. I was thinking the symptom I'm experiencing may be shock related, but I don't understand why it would do it on one side but not the other? I haven't thought about switching the shocks from side to side to see if that changes anything but that may be an idea to try. See, I'm from Missouri...the Show Me State, plus I'm mechanically inclined enough (but not engineer level by any means) to want to know and understand how something works and why before progressing with it. I have not gone down that path with damping control just yet (although I currently have 8 tabs open to threads here on the subject). Britt, can you (in laymen's terms) give me a quick explanation as to how adjusting the rebound of a shock will aid in the way my suspension works? In other words what exactly would be different with different settings of rebound vs what I have now with my over the counter shocks? While reading a thread here on anti-squat, something else came to me...and made me think maybe two different things are going on here. I tend to loose the back end coming out of corners under hard acceleration turning left...but not when turning right. 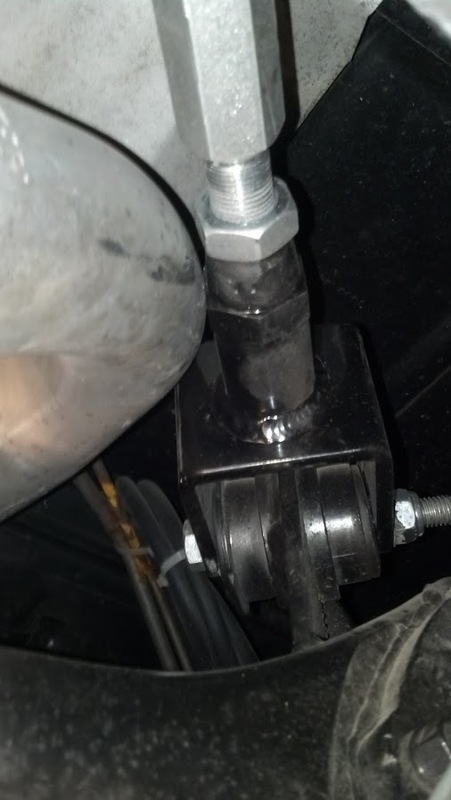 Could the drive shaft torque have an effect on this by raising the right rear under acceleration? Looking at my video again and watching both side's tires after Britt's post made me realize that both of the tires are reacting to bumps in about the same manner, but something is definitely different as I constantly have to watch how much power I put down leaving a left hander vs just hammering down out of a right hander with very different results. I'd like to see a picture of your rear sway bar at ride height. You might be loosing travel due to bind causing you to unload the tire. Shocks are pretty simple if you remember this. . .they are simply timing devices. They determine when things happen and how long they stay there. You are going down a straight into a left hand corner that's long and "smooth" (not the track surface, but in radius). As you approach the turn you apply the brakes, the weight shifts forward onto the front tires (at this point the front tires are doing most of the work). When the speed is acceptable you turn in. As you turn through the corner you want enough weight over the front so the tires keep grip, and enough on the rear so it doesn't break loose. (If you use a trailbraking technique you are effectively holding the weight on the front tires while scrubbing off a little speed allowing you to drive in harder and save time.) 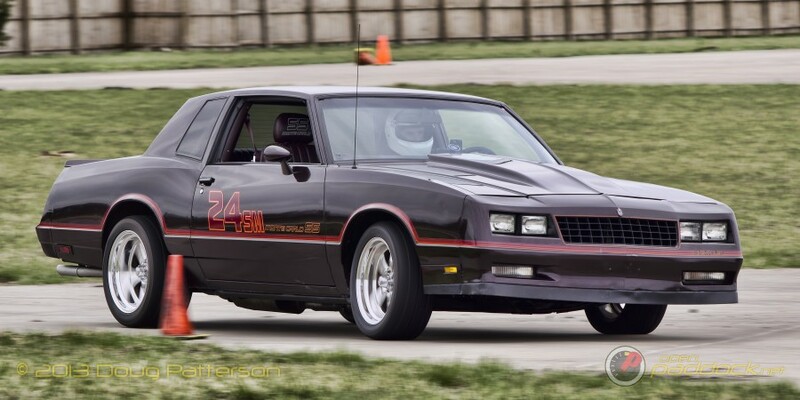 As you approach the apex you want the car perpendicular to the apex and the front tires straight (you are basically done turning) so when you pick up the throttle for corner exit the weight begins to shift to the rear tires as they need grip for forward traction. 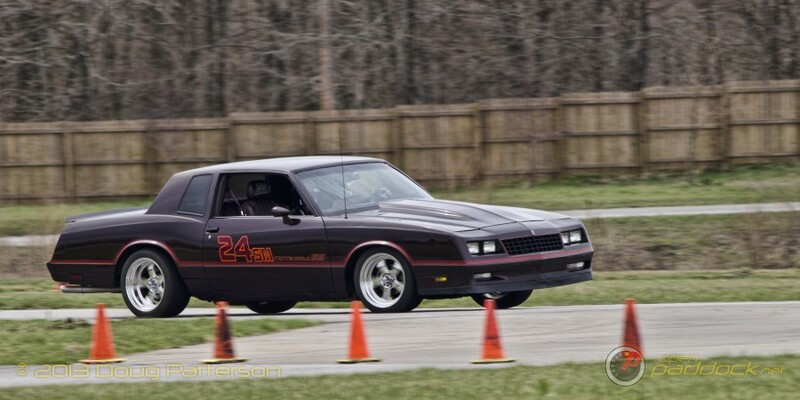 If the car is straight you don't need any weight on the front tires (think drag racing), but in reality the corner force is still pushing the car to the outside of the turn, so you need some weight on the front. The shock plays a major roll in when the weight is transferred. If the shock has too little rebound the weight will have transferred to the rear before you hit the apex, and the car will push (understeer) as the front tires are picked up off the pavement (not really picked up, but it gives a better visual). Now, that does not take into account rear rebound, or compression on any corner. Adjustments to these items will affect the timing. I don't like a lot of compression in a street car. 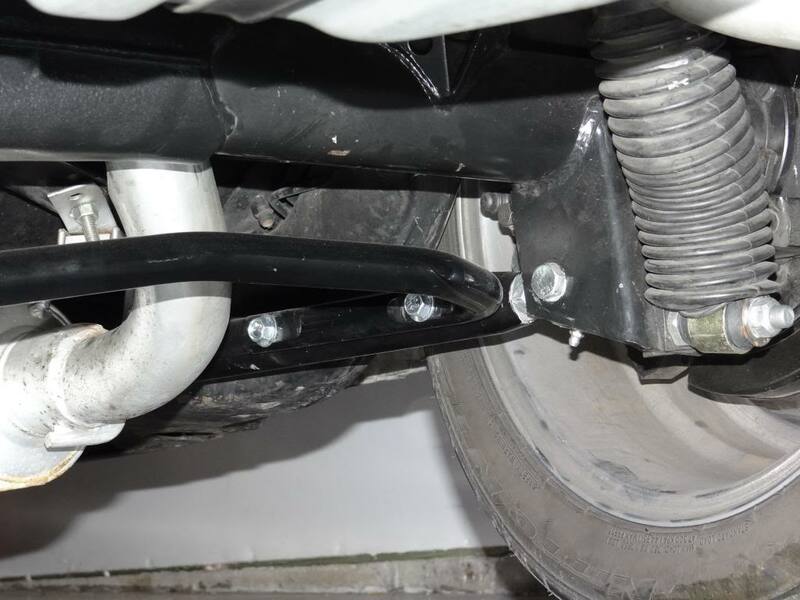 It's the springs job to absorb the impact of a bump, or to help control roll (sway bars have a major impact, but let's keep it simple). Additional compression is like having a very high spring rate. . .any harshness is transferred into the chassis as the force has to go somewhere, and the spring is not dissipating it. High compression forces cause poor ride quality. The info and examples above are very basic. There's a lot going on in an automotive suspension, and each has a positive and negative effect on all others. As always it's a balancing act. And remember, no two people have the exact same driving styles, so a "smooth" driver will have a different set up than someone who treats the pedals like a light switch! The beauty of an adjustable damper is that you can "dial in" just what the driver or car wants or needs. The downside is that you may have a thousand different setting possibilities, but only a few will work well. Only seat time, test and tune sessions, and reliable advice can overcome this. Thanks a LOT Britt, that helps a ton. I actually envisioned what a shock was doing in rebound and compression exactly backwards. You've made it much clearer, thanks. I have found with my car in it's current setup it runs quicker times if I'm smoother trail braking and under throttle, any abruptness with either pedal causes it to either understeer or oversteer...the more abrupt the worse the loss of traction on both ends. I've found if I left foot brake and modulate pressure between the gas and brake evenly the car stays settled and runs quicker. I'm still new enough that I'm not sure which method I prefer more, I've just learned to do this to make the car work. I'm okay at it I think, but I"m not opposed to being a pedal masher either if it'll work with the car. Now, back to the shocks... It sounds like my front shocks have too much rebound as the front stays down and the back stays up as the car exits a turn. The rear, I have never liked the shocks as far as street driving. 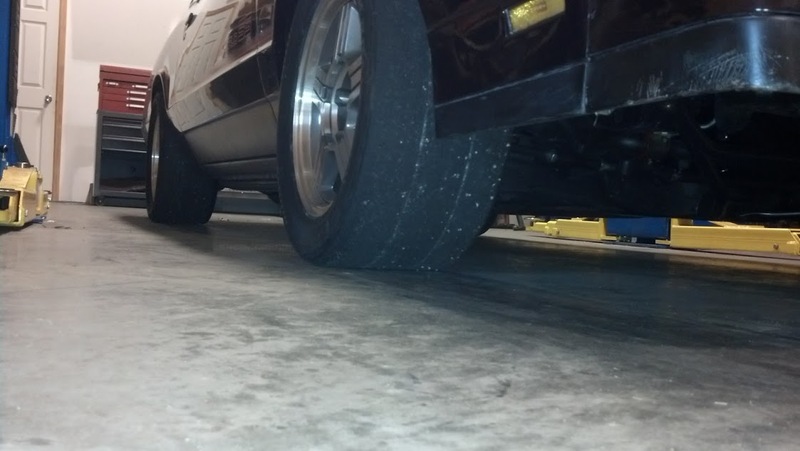 When I pull into my garage, that little 1 inch bump up onto the garage floor is almost jarring...it's so abrupt. Sounds like they have too much compression? Trying to do the work of the springs? Speaking of travel, I should explain another part of what I've had to do with the rear. 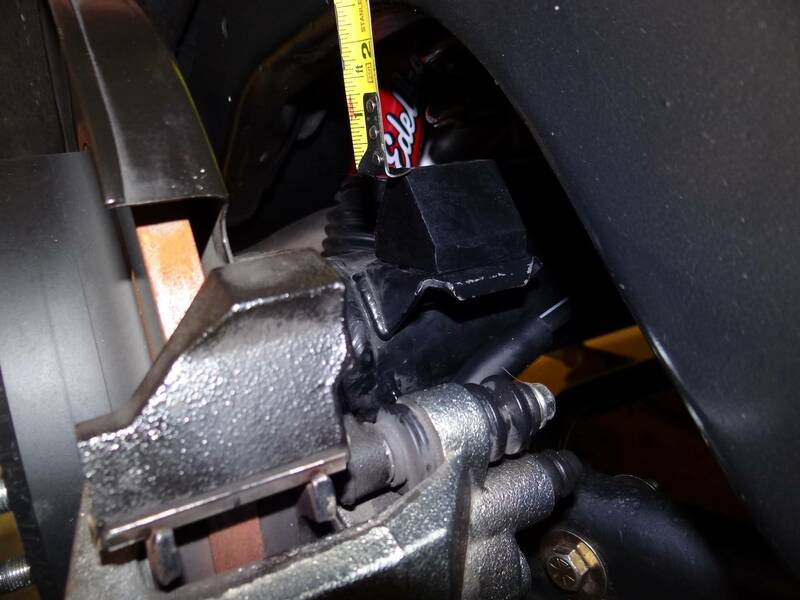 When I put the DSE 2" drop springs in, I had a clearance issue with my caliper bolts and the frame. I ended up spinning the brake backing plate 180 degrees on each side to get the most clearance I could get. But I still only have about 2.25" of travel before the poly bump stops touch the frame. I haven't seen much evidence of the bumps riding on the frame, but I could shorten them if I thought the frame was getting onto the bumps and upsetting the car. This is the main reason I did the rear wheel cam shots, I don't think this is and issue after watching the video, do any of you? The right tire has never rubbed the frame before, it's a 1/4" closer to the frame than the driver side. I think the 6 psi drop in tire pressure last weekend is what let the tire come over to contact the frame. The Hoosiers I'm running this week are on narrower wheels with less backspace so this won't be an issue with them. The exhaust hitting the UCA is a symptom of the new X-pipe put on in a hurry after I had to swap the headers due to the T56 swap last December. 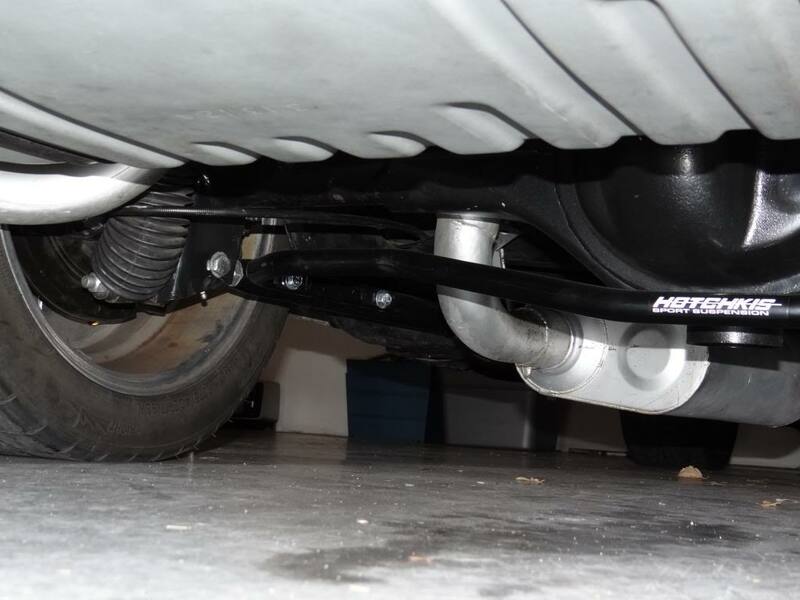 The tail pipes and mufflers kept rotating in the X pipe so the exhaust shop tack welded it in place, they just forgot to twist the over the axle part back up straight before tacking. I'll cut the tack weld loose and loosen the clamp on the X-pipe and lift on the bottom of the inside of the muffler to rotate things back into place and tack it up again. And the delrin joint just needs to be loosened, straightened up and tightened again. 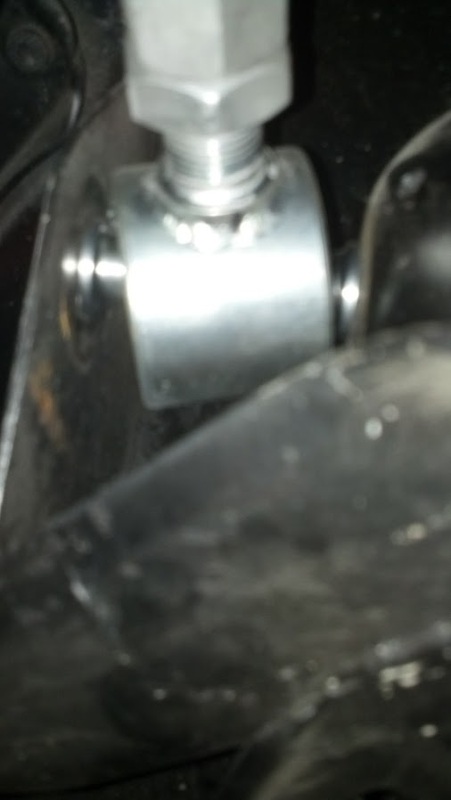 I'll need to verify the whole thing isn't loose therefore disrupting not only the pinion angle but also might be letting the axle move to the Driver's side. The bump stops do not appear to be contacting the frame (good thing), the frame was dirty and not wiped clean by contact from the poly stops. All of these problems are new this year, they were not part of the problem causing the loose condition last year, but I will correct them and put the new tires on and run this Saturday and see what happens. Thanks for your help with this everyone...we'll get it figured out soon. The corners at 1:58 are grooved concrete. The tires will have less grip there. Plus concrete that is smooth can have high grip, but usually has more sudden breakaway with greater loss of grip once the tire is sliding. Tires don't easily re-grip concrete like they do Asphalt. 67 Camaro RS that will be faster than anything Mary owns. 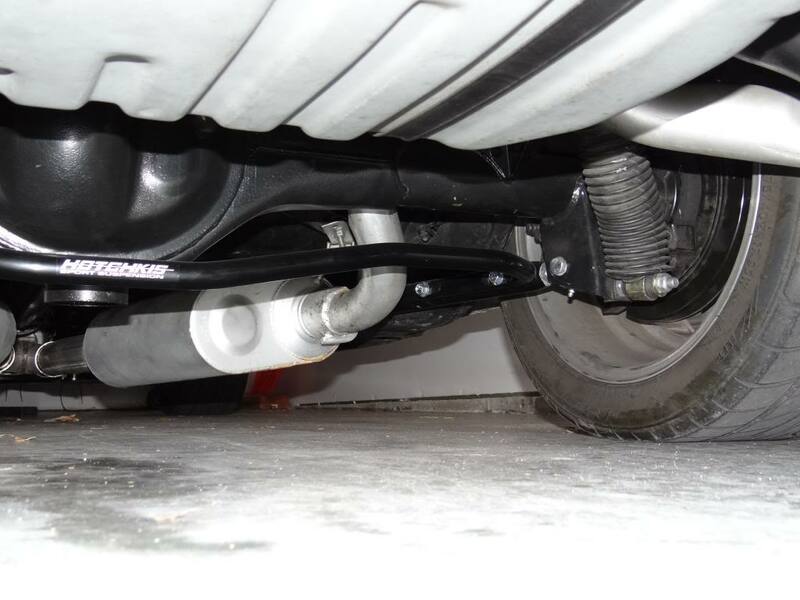 I used the IAS shocks on one of my vehicles years ago and the damping went away within a year or two. 69 Camaro convertible, 410, M22, 8-pt cage therapy program. SOLD. 67 Bel Air - New street project with perfect floors, frame and trunk! it was good to me you last Sunday Lance. I am definitely looking forward to round 2 as the weather looks to be oh so nice. I had fun last weekend as well, what car were you in? (I remember more people by their car than in person). I hope it warms up, I'm ready for spring to get here and stay this time. Not to take anything away from all the other info here but first thing I would do is square up the rear end. Your thrust angle is at .06 which probably doesn't seem like much but that's enough to make a new Volvo Semi have a pull. The rear is pointed to the right so right hand turns are going to feel better than left. Try to get it as close to zero as possible. Well, that was my intention with the new double adjustable control arms but the guys at the alignment shop said that that was pretty damn close and wouldn't make a big difference trying to get it closer to 0.00. If the fixes I've made don't cure it that will be my next move. That is the second time those jam nuts have come loose, gonna have to keep a closer eye on them. 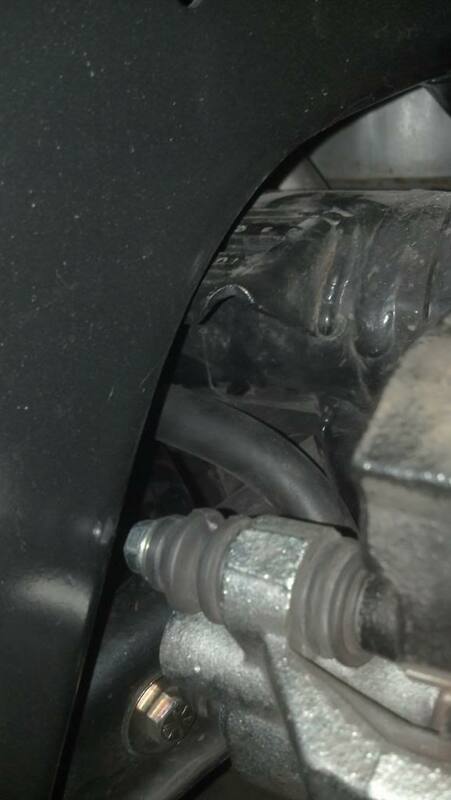 The tack weld on the exhaust joint behind the X-pipe broke and the clamp was loose, so the tailpipe rotated over into the UCA. I notched the female end of the X-pipe, re-installed pipe and clamped it down tight. Should have fixed that right the first time, now it's fixed though. Got my ZQ8 wheels with the Hoosier A6s on them mounted up and test drove and that all seems fine. I think I'm all set for Event #2 tomorrow, just have to load everything up. I'll report back with the results. Thanks for the help everyone. Good luck and have fun with it tomorrow ! I hate when guys at alignment shops don't do a complete job, you can tell them I work for Hunter Engineering (the company that built the machine they're using) and I think they cheated you! By the way my names also Lance! Car drove a LOT better today, part I'm certain was due to straightening everything with rear suspension out..the rest was the tires. I usually finish about 60-70th out of 100 cars or so in raw time...38th out of 97 cars today!! Didn't get much good video today, here's the best of the best anyway though.